I have been directing the Liturgical Movement Ministry at St. Patrick’s Church in Seattle for the past 20 years. 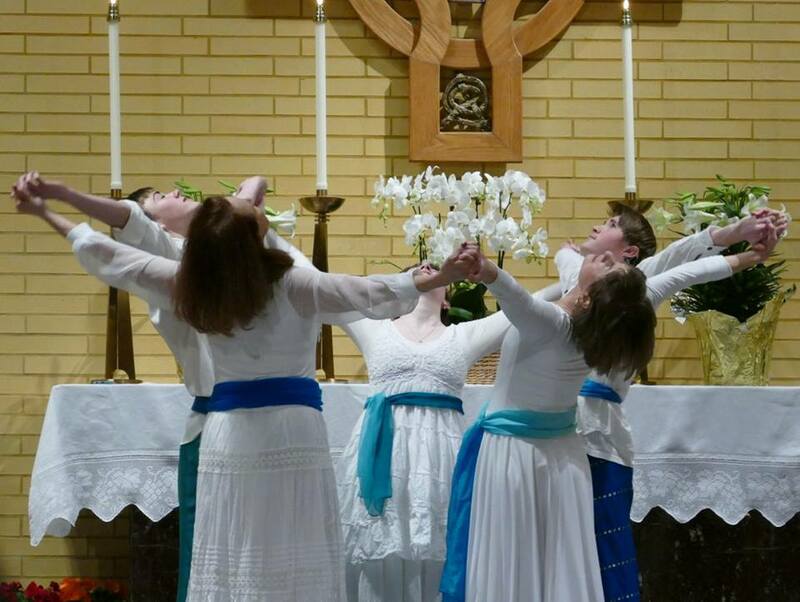 I am so grateful to have a home-base church community that is open to the gifts of movement as prayer woven graciously throughout our sacramental life. 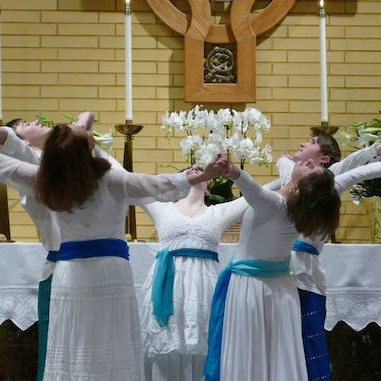 Our parish statement is this – “We, the people of God at St. Patrick’s Catholic Church, are a welcoming Christ-centered community committed to keeping alive the vision and hope of Vatican II. Our Sunday liturgy, enhanced by the creative arts, strengthens us for the work of peace and justice in the world and challenges us to live in communion with one another and all of creation.” I am honored to assist the parish in engaging the creative arts to pray through the liturgy with our whole bodies and selves and to nourish ourselves for the work of justice in the world. At St. Patrick’s we have a large deaf community, and so the entire Mass is signed in American Sign Language each Sunday. Over the past 20 years, the interpreters and Deaf Community have taught our ministry much American Sign Language so that we can incorporate it into our movement offerings and also support our entire assembly in praying in the language of gesture to honor our deaf brothers and sisters. 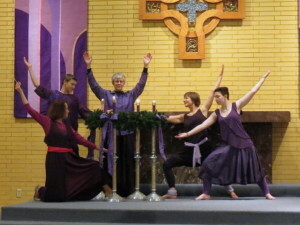 This clip captures the joy of integrating movement with the teens at the start of the Christmas Eve liturgy. Pentecost at St. Pat’s is one of the most exuberant liturgies of the year. Enjoy the procession and Reading from Acts offered by the youth of the parish. Such a joy to integrate Sign Language and participation with the children of our community! One of the Youth StoryDances that we have developed at St. Patrick’s has been published as a script by Church Publishing under their division Skiturgies. We are happy to share our artistry and prayer as a resource for the larger Christian community. Script available for purchase here.